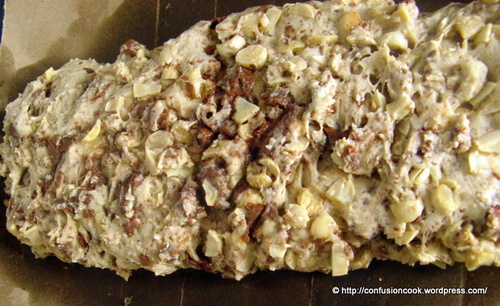 For this month’s sweet punch, they chose Chocolate Almond Biscotti from Joy of Baking. 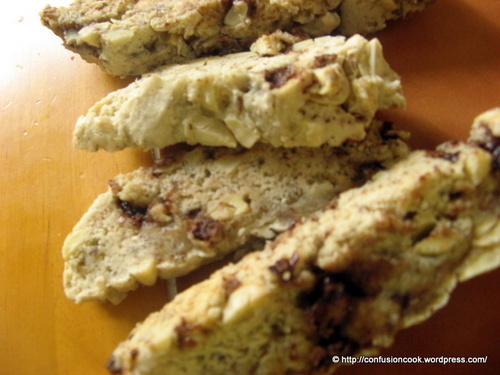 Biscotti was totally new for me, to tell you a secret, for the first time I’d consciously became aware of something called Biscotti. And again the challenge of substituting eggs came up. Everytime I divert from the given recipe, I’m quite apprehensive & excited about the outcome. I chose to replace eggs with Flax Seed as it works well where the dish has nutty flavour. I also used Milk compound Chocolate as that was available at home with me. My oven doesn’t have 165 C so I chose the closest to it (160 C) & increased the time by 2 mins. It worked fine for me. Pre-heat the oven to 180 C. Toast almonds for 8-10 mins or until golden brown & fragrant. Allow them to cool & chop coarsely. Set aside. Line a baking sheet with parchment paper or butter paper. In a medium bowl, beat together flax seed egg & sugar till thick & fluffy on high speed. This should take about 5 mins. Add in vanilla extract & beat well. In a separate bowl sieve flour, baking powder & salt. Whisk together. Slowly fold in the chopped almonds & chocolate. Transfer the dough on the lined baking sheet & make a log of about 12″ long & 3.5″ wide. You might need to dampen your hands as dough would be sticky. Bake for 25 mins at 180 C or till firm to touch. Remove from oven & cool on a wire rack for 10 mins. Transfer to a chopping board & diagonally cut the dough into slices of 3/4″ thickness. Reduce oven temp to 160 C. Place the biscotti cut side down on the baking sheet & bake again for 12 mins. Turn over the slices & bake for another mins. Remove from oven & cool on a wire rack. V as usual couldn’t wait to come back & enjoy them with some warm milk before bed. I was also busy nibbling on all the left overs from each baking cycle. :) I felt that my slices were not as thin as they should have been. This is a keeper recipe for me & I’ll surely improvise on the thickness. Till then enjoy with a hot cuppa! Today is my sister’s birthday. Wish you a very happy birthday with these biscottis & a promise that I’ll surely bake these for you when I meet you next. Love you Didi! Hope you enjoyed your b’day gift.